Kovai Kings failed to defend 125 runs. Siechem Madurai Panthers secured their maiden appearance in the 2018 Sankar Cement-TNPL final as KB Arun Karthik with not out 79 starred in their victory over Lyca Kovai Kings in Qualifier 2 at the NPR College ground in Natham (Dindigul) on Friday, Aug 10. Top two sides from the league stage will square off against each other in their first-ever final as Siechem Madurai Panthers will once again face the challenge of Dindigul Dragons at the MA Chidambaram Stadium, Chennai on Sunday, Aug 12. Chasing 126 runs against an in-form Kovai Kings’ bowling attack, the Panthers lost their first two wickets within the Powerplay. KB Arun Karthik, however, stood resolutely at the crease and accelerated at the right moments to clinch a famous win for the team. Finishing the chase for the team, KB Arun Karthik played a scintillating unbeaten inning of 79(56b,8×4,4×6). Captain Rohit D played the supporting role with a steady knock 30(37b,2×4). 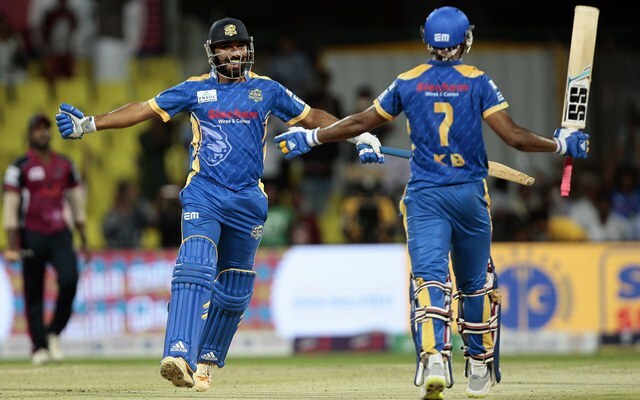 Earlier in the night, choosing to bat first in the all-important clash, the Kovai Kings slipped to 11-2 in the third over with the medium pacer Abhishek Tanwar taking both the wickets. The remaining inning of the Kovai Kings was dominated by two crucial partnerships. Captain Abhinav Mukund 28(30b,3×4) added 49 runs in 53 balls for the third wicket partnership with Ashwin Venkataraman 45(50b,4×4,1×6), the latter further constructed a stand of 57(45b) for the fifth wicket with MP Rajesh 29(24b,2×4,1×6). The Panthers then snared three wickets in the final over to halt the Kovai Kings for 125/7 in 20 overs. Lyca Kovai Kings 125/7 in 20 overs (A Venkataraman 45, MP Rajesh 29, A Mukund 28, Abhishek Tanwar 3-28) lost to Siechem Madurai Panthers 131/3 in 18.2 overs (KB Arun Karthik n.o. 79, Rohit D 30, R Mithun 1-15) by 7 wickets.